This New Year’s Eve I had the pleasure of uncorking the very good Louis Roederer Brut Premier Champagne. Bright and floral, with an incredibly lively fizz, the Roederer was a great way to ring in the New Year, marking my fourth year in a row celebrating properly with a good champagne. But it failed to hold even the faintest candle to what I drank the year previously, the best champagne I’ve ever tried. The 2002 Dom Pérignon. I remember lounging lazily by the kitchen table at my then-girlfriend`s house, buzzing bodily from a potent cocktail of alcohol and exhaustion. We had just polished off a bottle of Champagne Moutard: Rosé De Cuvaison, a minerally and extremely acidic bubbly. Not bad, but somewhat less satisfying than I had hoped. We planned on retiring upon finishing the Moutard; the night had been long and we`d both had a significant amount to drink. Before we could leave the table, however, her mom and recently married step father came home from a party. Initially dissenting their invitation for a drink, we eventually yielded, and I was sent to the fridge to grab a bottle of Champagne they had been given for their wedding. Knowing my then-girlfriend`s mom had no affinity for Champagne, I expected little more than a cold bottle of cheap Prosecco. Needless to say, I was more than a little shocked when I was greeted by the legendary gold shield and green bottle of one of the Champagne regions most legendary brands, Dom Pérignon. “It…it’s good,” I assured her. I pushed aside the pervasive buzz, and rinsed out my dry mouth with some tap water before sitting down with the Dom. I intended to do this wine some justice. I uncorked it slowly and steadily, not risking any spillage. After laying aside the cork, I poured it carefully into the four flutes that had been fetched. The bubbles were big and round, floating lazily upwards inside the tall stemmed glass, seemingly with a certain cool authority. The Dom looked imposing, less jubilant than its inferior kin. It commanded the attention of the audience. I brought the glass to my nose and took a whiff. The scent of bread, wet stone, and bright citrus met me. Finally, mustering my faculties I took a sip. The ’02 Dom was stupidly smooth. I say stupidly because I felt immensely stupid trying to quantify the incredible texture of this Champagne. Velvet was an injustice, silk an understatement, and to call it buttery would be utterly pedestrian. It was stupidly smooth. The taste was all sourdough, limestone, and grapefruit, each balancing out in orchestral harmony the other. It was other-worldly. I remember not brushing my teeth that night; I wanted to fall asleep with the taste of the Champagne still on my tongue. Never before and never since have I met its bubbly equal. 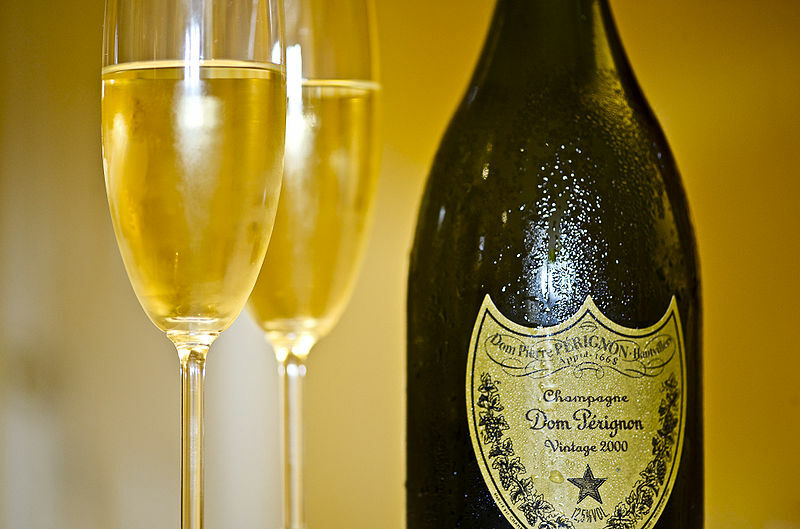 One day, when my finances are in a more agreeable state, perhaps I will go and purchase a good vintage of Dom for a New Year’s celebration of my own. But at roughly $230 a bottle for the 2002, that might be a while. If you ever get a chance to try this incredible beverage, I urge you to take your time with it. Calm your excitement, ease your tension, rinse out the taste of whatever lesser drink had been in your mouth previously. And make sure to sip it real slow.